Today's Reader's Spotlight is on - Nidhi. I recently had a farewell at my school where we had to dress in a saree. I am sending you a picture of me in the same and I want to know what you think about it. I have been a great fan of your blog for some months now and I think you are absolutely amazing. I am not wearing much accessories as it was a school thing. P.S. My friends think I kind of look like you due to the nose ring. Do I? O.M.G. Nidhi, you are a vision in this saree. 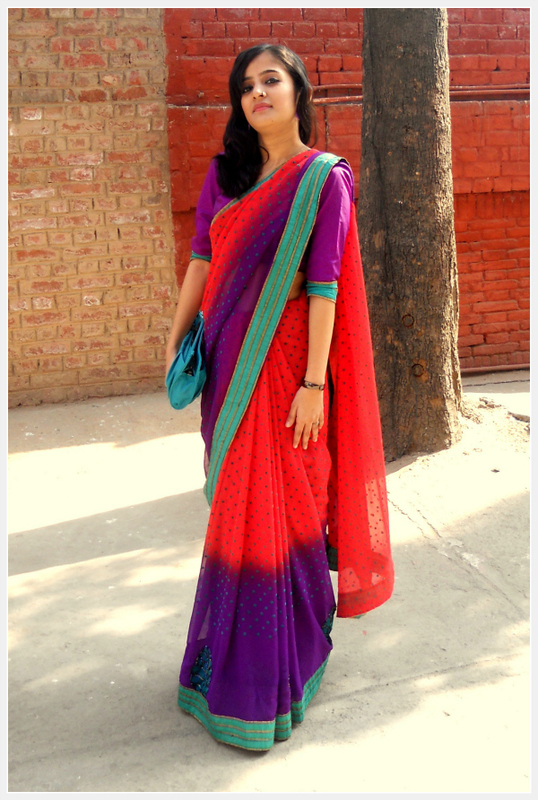 I am so glad you sent me a picture of yourself in a Saree as people seldom do that on Indian Blogs. I love the riot of colors and as far as I am concerned you are looking lovely. Completely understandable that you kept it light on the accessories due to the venue. That's exactly my motto, dress according to the place and occasion. And about your question. I don't know if you look like me, but you do look amazing and the nose ring really suits you! :) What's the verdict readers? Do you like the look as much as I do? P.S. Genuine feedback is welcome, nasty criticism is not. but to me she is looking v nice.. This is my favorite Reader's Spotlight so far! Nidhi is looking great ! The blue coloured patch in the sleeve of the blouse that matches the color of the bag that she is carrying - everything is complimenting her! The fact that she chose to wear a quarter length traditional looking blouse is adding to the aura of the whole outfit. And the Color combination of the saree- so beautiful- maybe it is an example of Color blocking in Indian design ! She certainly looks lovely!! Love the play of colors and they seem to suit her well too! Ahh and I'm passing by your home city next week but my friend won't be coming anymore so I'll have to figure out (make someone else) how to tie my saree! SO cute!! Love the colors of her saree. What a gorgeous saree! It makes her look like she's 10 feet tall! The best readers' spotlight yet! She's pretty like anything! The nose ring complements her so well! The sari is out of the world! I LOVE the fact that she chose a long-sleeved blouse in stead of giving in to the gimmick of a itsy-bitsy strappy backless number. Though I'd have liked it more if she went sans accessories. The vibrant colors of the sari,paired with the nose ring,was a powerful enough look. I feel there was no need for the bangle even but then again,it's my perception.And like I keep complaining,SHOES,people! I don't feel content until I see THE SHOES! Kolhapuris,loafers,pumps,stilettos or gladiators...no outfit post is complete for me without the footwear. Please try to send in pictures with the shoes. Nidhi, wow....love the look. You are carrying off the saree really well. I also like your blouse because it's a style you don't see that much. Super cute attitude! She's so gorgeous, she smoulders! Wow..Nice colors..Simple yet Classic !! Nice Saree and excellent blouse pattern its kind of vintage. Just a suggestion for yesterdays blog I don't think it is right to say to "tie" a saree. It is always said to "drape" a saree. Love the colours, the blouse style is also good! All in all Nidhi looks really pretty! The saree is gorgeous - coral/red and turquoise is one of my favourite colour combination and the purple adds a fun factor to it, so I think you look awesome :). i totally love the look, indian mix of colors is always so inspiring! This saree is beautiful! Luv the ombre colors! wow!! such fun colors..i am sure she stood out ! Nidhi looks so beatiful in that saree, love the color. Nidhi looks absolutely stunning!!! I love the bright, vibrant colours & she's carrying it very well. @Tanvi - voted for you in that contest on the very first day. Totally hope you win. Forgot to mention the other day. Her Saree is absolutely beautiful! i think she looks gorgeous and she wears the colours of the saree quite beautifully. She is so pretty and you guys do favor. Love her dress! she's one of my fav bloggers! Love her in this outfit.. my eyes are smiling!